Read the safety rules for work with your power angle grinder. Failure to follow the safety instructions for using the power tool and ROTO RASP may result in electric shock, fire or serious personal injury. Please pay attention to technical specifications of the power angle grinder (power, maximum number of revolutions and class of electric safety). 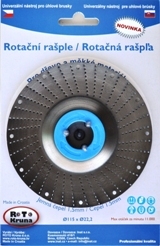 Please read the instructions for working with ROTO RASP wheels. Do not throw them away. If you are lending the ROTO RASP wheel to anyone, please give him these instructions together with the tool so that he can get familiar with the conditions for safe work. ROTO RASP is a tool for grinding soft materials (wood, plastics, rubber, styrofoam, artificial tars). It is not suitable for grinding metal. Caution: Use whole working surface. For safety reasons and longer lifetime do not use damaged disc!!! Before the assembly inspect the ROTO RASP grinding wheel for any damages. Do not use cracked or deformed ROTO RASPS. Make sure the power angle grinder is disconnected from the mains supply. Place the backing flange on the spindle of the power angle grinder. Place the ROTO RASP disc on the backing flange and center it. Pay attention to the correct positioning with respect to the curved surface of ROTO RASP. Use an adequate flange and wench to tighten the ROTO RASP wheel in position for work. Use only the original flanges and tools for tightening. Check whether the wheel safety guard is secured and if necessary tighten it additionally. Do not start the tool without safety parts. Use your hand to check whether ROTO RASP can rotate freely. Start the power tool for a 30-second trial work and let it come to the maximum number of revolutions. In case of major vibrations or other faults, switch the power tool off immediately and then look for possible causes of vibration. Operate ROTO RASP grinding discs outdoors, on flat surfaces without obstacles preventing free movement around the work place. The work area should be well lit. Keep away from flammable liquids, gases or dust. The workpiece should be fixed in a position for work. Before start remove any metal objects from the workpiece (nails, screws, hooks etc.). Any distractions can result in loss of control over the tool. Keep bystanders, children and animals away while working with ROTO RASP. Removed particles can fly away and cause injuries even outside direct work area. Make sure you use protective goggles. Use other protective clothing depending on the material, power tool, location of work area and duration of work. Other protective equipment includes: protective gloves, mask, ear protection and non-skid footwear. If filter bags for vacuuming and catching removed particles can be attached to your power tool, make sure they are installed correctly. Dress properly. Loose clothes, long hair or jewellery can be caught in moving parts and cause serious injuries. Do not over estimate your abilities. Take a safe and stabile position and keep balance. Hold the power tool only for the insulated handles. Due to unforeseen circumstances the supply cord may get damaged or cut. Do not force the power tool or ROTO RASP. Pressing the ROTO RASP wheel against the workpiece does not increase its efficacy, but unnecessarily raises the temperature of ROTO RASP and forces the power angle grinder. Forced cooling with any types of liquid or oils is not allowed. Do not use ROTO RASP while tired, under the influence of drugs, alcohol or medications. Do not use worn out or damaged ROTO RASP wheels. Sharpening grinding blades is not allowed. Do not put the power tool down before ROTO RASP has come to a stop. Never use side force to stop rotation of the tool parts. ROTO RASP can be hot after use. Do not touch it until it has cooled down. ROTO RASP wheels can be used only by individuals trained for work with power tools and familiar with potential risks from use of rotating grinding wheels, as well as with safety measures. 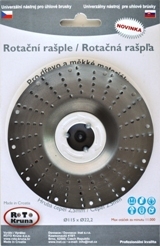 ROTO RASP wheels can also be used by individuals supervised by trained persons for purposes of training if they are familiar with all safety measures. Disabled individuals (with any form of physical disability or psychical disorder) can use ROTO RASP wheels only if supervised by a responsible person. 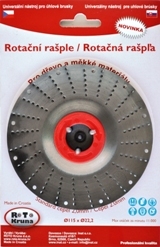 ROTO RASP is made of steel tin and polypropylene flange which after separating can be entirely recycled. Do not dispose of the wheel together with household garbage. In line with local regulations the wheel should be disposed of in recycle yard or in special containers for disposing of metal. Keep ROTO RASP in a dry environment. Make sure the blades do not come in contact with metal surfaces. Do not place any objects on ROTO RASP wheels. Deformed ROTO RASPS must not be used.